Continuing to add features to WhosOff.com , here`s a few additions that have been requested by our users. We have added some new Staff reports in the Reports area which will be useful to Super Users and Administrators. The Staff listings are By Approver, or Department or just All staff. The reports include their start date, Department, Approver, and Opening/Remaining Balances, so these reports will be particularly useful when managing the cross-over into the new company year. The first in a set of updates coming soon, after speaking with some of our users we have included in the staff notes when a leave request has been approved/declined. The Yearly Breakdown Report (Summary) has been updated to include any carried over days for the selected staff members. At WhosOff we continue to use customer feedback to improve the WhosOff service. Bulk import tool now available. We just wanted to let you all know that our scheduled maintenance of the WhosOff service has now been completed and the service is now fully available again. Sorry for any inconvenience caused. On Monday 19th September from approx 2100hrs GMT , we will be implementing routine maintenance on WhosOff.com .We anticipate that the service will be unavailable for no more than 1 hour. Calendar Feeds - Now Available By Tag! If your company makes use of tags to group individuals, and you have a number of calendar feeds, Super Users can now setup and make available calendar feeds by tags. Leave statistics and scheduled reporting straight into your inbox. Overtime, ability to switch off! Fancy half an hour off? If you need to take the odd half hour here or there, soon you will be able to manage this in WhosOff*. Companies making use of the new tagging system are now able to use the reporting by Tag feature. We have introduced `Grouping Tags` . These Tags will enable your company to group departments . 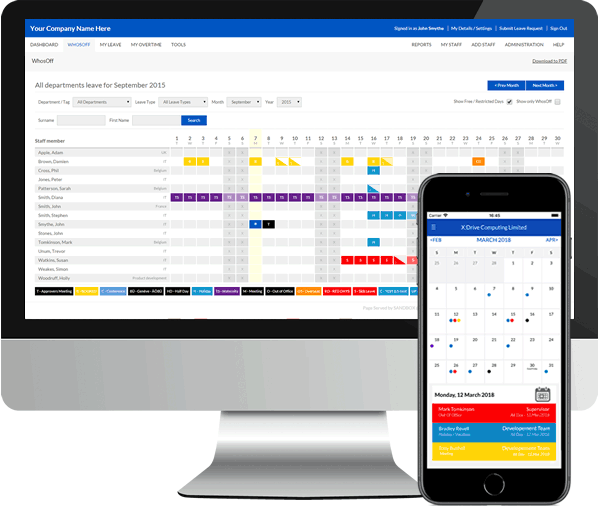 If you`re looking through the WhosOff view to find key members of staff that are off in a given timeframe, instead of seeing all staff irrespective of leave, now you have the option to see only those staff members that are off in the selected period. New Interface, new features, faster development! Load balanced technology has been introduced to the WhosOff platform along with a number of useful updates and a structure to allow for faster development for our users` requirements. As a result of user requests we have increased the maximum number of leave types any company can have from ten to fifteen. User Yearly Calendar is back! The report "User Year Calendar" from the previous edition of WhosOff is now available in the Premium Edition of WhosOff. Visit the Reports area for the new style calendar report. Instead of adding days per department you can now select multiple departments to add Free days for. Want to allow staff to take a maximum of 14 days holiday in one go, but only a maximum of 2 days sick, now you can. When using the system, whenever you change the department which you would like to view (e.g. WhosOff today on the dashboard), the system remembers your preference and this stays with you until you logout, also very helpful when administering your staff - Thank you to those super users who have requested this, hope this helps. Quickly find out which members of staff are off today, tomorrow or remind yourself about yesterday. Check out the new options on the WhosOff today area on the dashboard once you have logged in. Super users are now able to approve leave requests that have expired using the "Pending Leave Reqests" area. Leave request Notes - Visible to ? Super Users - you can now set which levels of staff member can see which leave type notes. If you want to hide sick notes, you can. If you want to show course details to only approvers and super users you can.